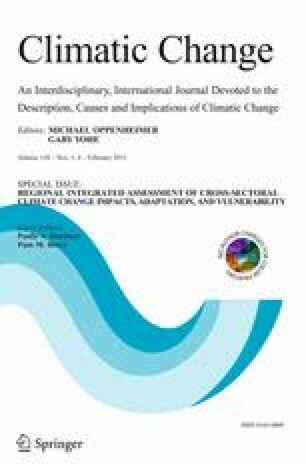 Assessment of agricultural vulnerability to climate change is a prerequisite for developing effective adaptation options and strategies for the future. While assessment approaches vary across sectors and countries, there is a need to devise an effective method to assess agricultural vulnerability and provide information to policy-makers and stakeholders so that they can take appropriate adaptation actions. Agricultural vulnerability is analyzed as a function of exposure, sensitivity and adaptive capacity using a multi-indicator approach. Spatial and temporal assessment is undertaken through constructing maps of agricultural vulnerability in China. The results indicate that using multiple indicators is very practical for assessing agricultural vulnerability and that agricultural vulnerability is already significant in Guizhou, Guangxi and Yunnan provinces in China and will become more serious in the 2040s. It was also found that adaptive capacity was generally underdeveloped in poor regions, such as Guizhou, Yunnan and Gansu. We recommend that policy-makers increase investment in improving irrigation infrastructure and provide more opportunities for the education of farmers and stakeholders together with developing the economy in vulnerable areas. This work was supported by the CLIMSAVE Project (Climate change integrated assessment methodology for cross-sectoral adaptation and vulnerability in Europe; www.climsave.eu) funded under the Seventh Framework Programme of the European Commission (Contract No. 244031), National Basic Research Program of China (973 Program) (No. 2012CB955904), National Science and Technology Support Program (No. 2013BAD11B03) and The Agricultural Science and Technology Innovation Program of CAAS. Authors wish to thank Prof. Yinlong XU for providing climate data and Dr. Shuqing Huang for collecting the socio-economic data.